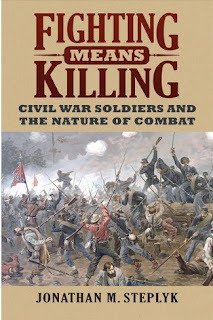 The Civil War experience of combat has been discussed in depth by Gerald Linderman, Earl Hess, Brent Nosworthy, and others, but Jonathan Steplyk's Fighting Means Killing: Civil War Soldiers and the Nature of Combat is most heavily influenced by Dave Grossman's On Killing (1995). Like Grossman did before him, Steplyk takes the reader through the most fundamental aspect of conducting war—the killing of one's fellow man. Along the way, he explores the cultural and innate psychological parameters that allow soldiers to both kill and live with themselves afterward. With On Killing's focus on modern armies, along with its author's controversial theory that today's civilian society conditions citizens to commit violence in a similar way that professional military training does, one might question specific applicability to mid-19th century citizen-soldiers. However, in discussing the military training and experiences of Civil War soldiers as well as the societal and cultural factors that influenced their approaches and reactions to killing, Steplyk finds universal themes to usefully explore. Steplyk certainly agrees with Grossman that in order to kill efficiently the average soldier on the battlefield has to subdue significant ingrained resistance. When the opponent is a countryman this hurdle becomes more difficult to overcome. The book begins with a brief but keen exploration of the antebellum social and cultural forces that lay behind breaking down those barriers and allowing Americans to kill Americans en masse. Among the most significant were conditioned sectional animosity built up over decades and the increasingly violent political discourse of the years immediately preceding the war. Religion was also a key facilitator. While Christian faith led some to completely deplore all forms of killing, most men on both sides were able to frame their own religious beliefs in ways that both sanctified their own cause and justified killing the enemy. All of these factors will be readily recognized by most Civil War readers. According to the author, the very nature of Civil War combat helped make killing more psychologically acceptable. It is convincing to propose, as Steplyk does, that the solidarity of close order formations provided moral reinforcement and coercion in equal measure. Studies have shown that killing from a distance tends to be less mentally traumatic to participants, and the dense smoke that settled over the Civil War battlefield also meant that soldiers very often did not see the immediate results of their fire. While some had few compunctions, many other soldiers wrote about the comfort they felt in not knowing for certain if their fire struck an enemy. Killing also had its own plastic language, and Steplyk highlights many of the euphemistic terms that Civil War soldiers came up with to presumably distance themselves psychologically from the act. Steplyk's research reaffirms the consensus conclusion of prior historians that actual hand to hand combat in the Civil War was relatively rare. The author also finds support for the oft-repeated assertion that soldiers preferred clubbed muskets to stabbing enemies with bayonets. In Steplyk's view, at least important as the general reluctance to intimately stab fellow human beings with sharp steel is the supposition (probably accurate) that few Civil War soldiers were trained enough in bayonet exercises to confidently use them as the primary melee implement in life or death situations. In contrast to what many writers and historians have said about Civil War sharpshooters, Steplyk finds that most soldiers did not generally despise them or their practices of hunting men from concealment and shooting victims from long distances. Except when it came to killing pickets during inactive campaigning or firing on those heeding the call of nature, the author found it more typically to be the case that Civil War soldiers readily accepted the practice of what we would today call 'sniping' and often admired (grudgingly or otherwise) the shooting skill so often displayed by friend and enemy sharpshooters alike. Instead of being shot out of hand in a manner similar to what was done to captured bushwhackers, sharpshooters were also willingly taken prisoner by both sides. The author is not the first to say so, but the book convincingly argues that sharpshooters were not the uniformly hated outcasts of the conventional Civil War battlefield. The study also gains insight into the limits of killing by examining the extremes of battlefield behavior. While much attention in the literature is paid to unsanctioned killing, Steplyk usefully reminds readers that Civil War soldiers also went to great lengths to avoid killing. This was demonstrated by a widespread willingness among Civil War soldiers of both sides to take prisoners in the heat of battle, very often in situations that involved significant risk to themselves. Civil War students can surely recall from their reading countless instances of officers and men being killed during the act of demanding surrender. As Steplyk notes, the ease with which soldiers switched between killing and fraternizing also supports the view that when it came to killing the vast majority of Civil War soldiers found a mutually acceptable middle ground between the extremes. Racially motivated violence is another significant aspect of the study. In this area, Steplyk's commentary is very much in line with the analyses and interpretations of previous authors (ex. Burkhardt, Fuchs, Cimprich, Urwin, Barnickel, and others) who have addressed the topic, particularly in the context of the fighting at Fort Pillow, Petersburg's Crater, and Milliken's Bend. Curiously, Steplyk limits his analysis of racial animosities in combat to those between white and black soldiers, not addressing similar racially-charged violence between Union volunteers and Indians tribes on the western frontier (though to be fair it might be the case that the author believes, like some do, that Sand Creek, Bear River, and other examples lie outside relevant Civil War context). The book's epilogue also briefly discusses the range of thoughts that Civil War veterans had about killing when looking backward from the postwar period of national reconciliation. The analysis can be a bit uneven in places, but these moments are largely limited to discourse tangential to the study's primary arguments. The book's discussion of hard war limitations doesn't seem to be reflective of the full range of the current literature. For instance, Steplyk's rather breezy dismissal of most talk of "total war" as Lost Cause rhetoric ignores a significant body of modern scholarship that has clearly identified pockets of the war where violence against civilians clearly approached what one might consider total war. Along similar lines, the author's admiration of official Union policies of restraint and directed retribution isn't well balanced by recognition of how wildly inconsistent their application proved to be in the field. When assessing overall Union and Confederate recognition of and respect for the laws of war, one could argue with justification that the gulf between the two sides was not as extreme as the author proposes. Fighting Means Killing is the first of its kind, the only book-length exploration of the act of killing on the Civil War battlefield. It provides a meaningful analysis of the social and culture forces that made taking the lives of fellow Americans acceptable to Union and Confederate volunteers. The author uses a variety of firsthand sources to reconsider how participating soldiers both experienced and perceived different modes of killing and presents his findings in ways that sometimes challenge traditional interpretations. The book also usefully explores the ideologically and racially motivated extremes of killing, which were just as often counterbalanced by extraordinary acts of mercy. Recommended.